Carol and Everett Francis, aka Capt. Porky, at the entrance to their iconic store on Dock street in Edgartown. Pretty much anyone on Martha’s Vineyard who wants to put a line in the water knows Captain Porky’s Bait & Tackle Shop in Edgartown. Porky, whose real name is Everett Francis, has owned the tackle shop with his wife, Carol, since 1993. That’s a quarter-century of lures, reels, rods, flies, and, most importantly, friends down on Dock street. 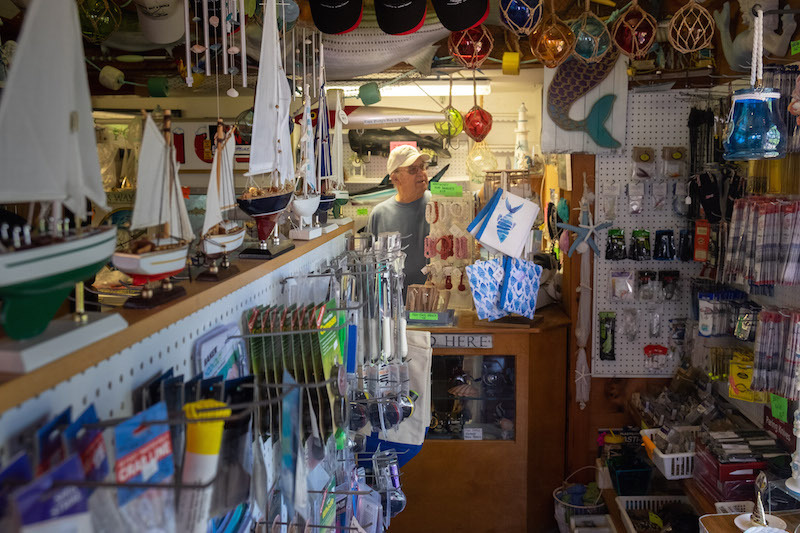 But two weeks ago, the couple sold the tackle shop to Peter and Melissa Sliwkowski, owners of Larry’s Tackle Shop in Edgartown. “Porky’s part of the Island fabric,” Mr. Sliwkowski said. The couple want to honor that by keeping a tackle shop in the same location. They’re going to call it Lil’ Larry’s, and hope to be open by the weekend of July 15. 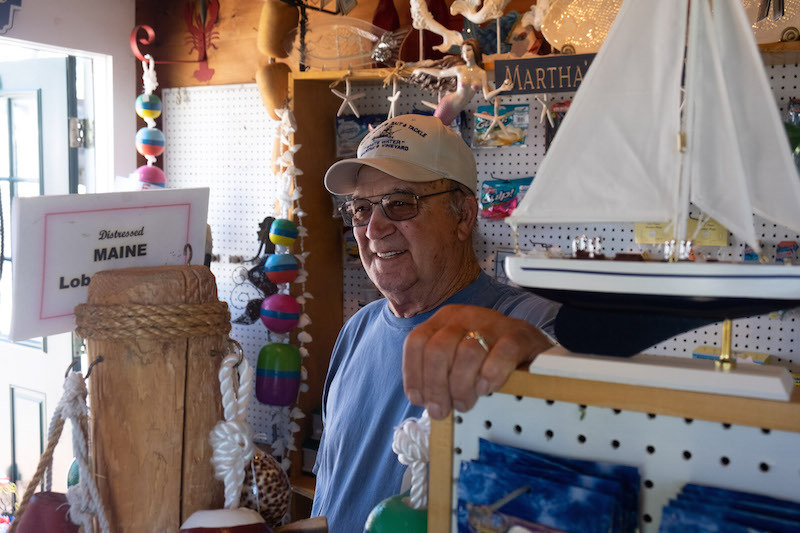 Larry’s Tackle Shop began in Edgartown in 1947, so Mr. Sliwkowski sees the purchase of Porky’s as an effort to come full circle with his own business. “Porky’s an icon, and he’s got a lot of history in that spot too,” Mr. Sliwkowski said. Icon is the word most people use to describe Porky, who was born on the Vineyard and has spent his whole life here. His uncle, Roy Campbell, whose fishing boat is now in Mystic Seaport, put Porky on a dingy when he was seven or eight years old with a hand-line and a hook. Although he has been a licensed electrician since 1964, Porky would spend his summers fishing, and try his best to get in some clamming, quahaugging and scalloping during the winter. He met Carol on the Island 48 years ago. She came for a July Fourth weekend and never left. In 1993, Carol traveled to Florida with a girlfriend. When she came back, Porky picked her up at the airport and had some big news to share. Since then, the legend of the shop, and the couple who owned it, has only grown. 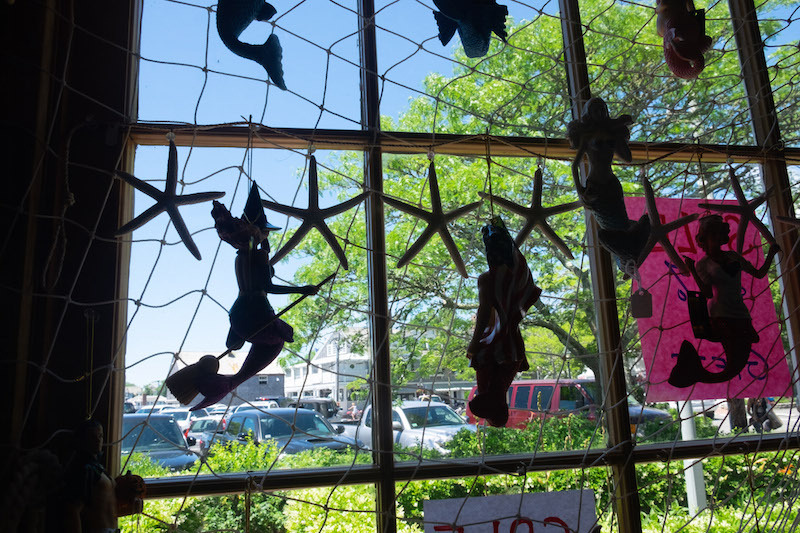 While Porky took Billy Joel out on fishing charters, caught sailfish so large that they scared the taxidermist, and fished a tidal island so often that it’s now named after him, Carol became a presence in the shop, passing along Porky’s secrets and endearing herself to the Edgartown community. Carol described one customer who would come to the shop from England every summer. They became so close that she invited Porky and Carol across the pond, where her boyfriend worked as Princess Diana and Princess Anne’s bodyguard. They got to stay at the Queen’s summer castle, Balmoral, and watch the changing of the guards from inside Buckingham Palace. The Queen even granted Porky special permission to fish the River Dee in Scotland. On that day, however, nothing was biting. “But I got a good buzz because they had a whole liquor cabinet there,” he said. According to Carol, Porky’s had the same dry sense of humor since he was a young man. If asked where the fish are, he’d reply, “In the water.” His favorite spot to fish, is, of course, wherever the fish are. And the trick to running a tackle shop? “Being a good liar,” he’d say. Porky’s demeanor made him great with children. Gina George brought her son Nick into the store when he was five years old. Ten years later, Nick still hasn’t left. Photos of Nick with his catches line the wall above the cash register. The first one shows Nick with a fish almost as big as he is. All joking aside, the pair do have big plans with their newfound free time. They want to travel, and Alaska is the first place on their list. Porky’s angled all over the world, from Hawaii to the Mediterranean, but he’s never been to Alaska because he’s always worked full time in the summer. Even with those adventures on the horizon, giving up the shop won’t be easy. When she told Wendy Perry this past weekend, the pair embraced. Selling the shop doesn’t mean that Porky and Carol won’t be involved. Mr. Sliwkowski wants the couple’s input, and he thinks the transition will be easy. All he has to do is build upon the business that Porky and Carol created. “We’ll keep the fingers in it,” Porky promised. And Carol may not have a choice. “They’ve already asked me to work for them,” she said. Congratulations Porky and Carol - thank you for all the Derby memories for my sons when they were young., Porky you always made sure that they had a fish to weigh in, and being on the boat with you was always a an adventure and great time. My sons still talk about their experiences on your Derby charters, I am just sad that my grandson will not be able to fish with you. Best wishes on your retirement, and enjoy the travel. Wonderful news! Wishing you all the best Carol & Porky! 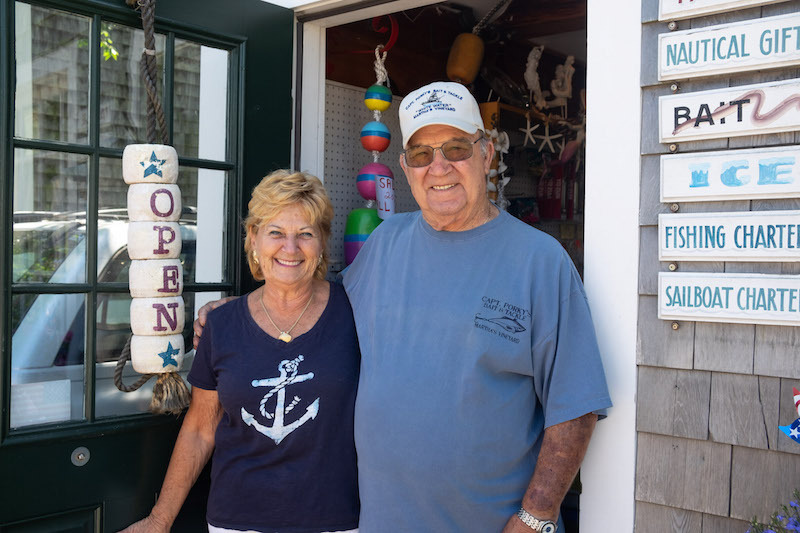 Peter & Melissa are the right fit to keep the legacy of a tackle shop alive on Dock Street. After all, where else downtown can you get a dozen eel and a block of ice in your cooler? Good luck Porky & Carol, Pete & Melissa! Thx u for teaching my son, Robert how to fish and planning an amazing father, grandfather, grandson fishing trip every year. You two will always be remembered as the best fishing consultants! Dear Carol and Porky, You will finally enjoy your summers like the rest of us old timers. You earned it, you deserve it. You will be missed by the many who sought your advise and expertise. Have a great Summer. All the best to you both. The parade starts at 10 in the Camp Ground. I can't believe that they are retiring - I used to vacation on MV every year and have very fond memories of Carol & Porky. I remember Porky fishing on the River Dee and I was really disappointed that he didn't catch anything, but very few people can say they have fished on the river at Balmoral. Good luck to both of you - Marthas Vineyard is a wonderful place and Capt Porky's is legendary. Best wishes Porky (and Carol). We grew up together during summers at Owen Park. Enjoy your retirement. We have been going to MV for over 20 years and Carol and Porky were always one of my first stops once we made it to the Island. My entire family makes it in to see them and of course Carol always greets us with a big hug and a chance to catch up on things since the year prior. Hopefully Carol will still be behind the counter a day or two a week so we can carry on the tradition. Congrats to Larry’s on purchasing this island landmark and Carol and Porky for being able to enjoy some well deserved down time. You will be missed! Carol and Porky, Congratulations you two !! You both deserve some time for fun of your own. You've made sure everyone had fun fishing over all these years, now it's your turn. Enjoy Alaska fishing! !